Dr. B, what is blood test timing for dog dental work? Home » Pet Care Info » Dr. Baum, what is the right blood test timing for dog dental work? Dr. Baum, what is the right blood test timing for dog dental work? I know we need blood tests before taking our dogs in for teeth cleaning, and we had bloodwork done during a recent exam. How long do we have before the blood tests are not good for the dental work? Blood test timing for dog dental work involves making sure results can be viewed in a timely manner for dental work, which may involve anesthesia – the tests are a pre-anesthetic screen. Generally these blood tests are good for three months, but the time can be longer or shorter depending on the age and health of the particular animal. NOTE: If you live in the Los Angeles area, and your pet’s teeth need an exam, cleaning or other work, check our CSAH Low Cost Dental Clinics. For more information on your pet’s dental health care, please read pet dental health care tips. For more about pet teeth cleaning, please click cat teeth cleaning. This Q&A from Dr. B offers more for our cat-loving friends on cat gum disease. 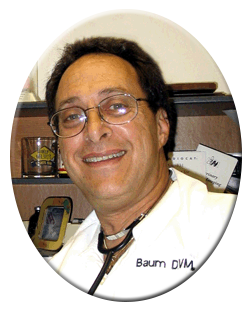 Dr. Baum has been the owner and Chief of Staff at Center-Sinai Animal Hospital, Los Angeles, California since 1979. The hospital has been serving the Los Angeles community for over thirty years. Read more about Dr. B!